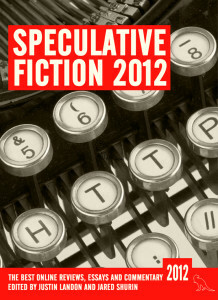 Speculative Fiction 2012 is out now! This collection contains over fifty of the year’s best online essays and reviews, from Tansy Rayner Roberts on Supergirl to Lavie Tidhar on China Miéville to Aishwarya Subramanian on My Little Pony to Joe Abercrombie on, er, himself. It is a diverse collection of some of last year’s best and most interesting writing. We fully expect – and hope – it will cause discussion, debate and a bit of a ruckus. The book also contains a foreword from Orbit author Mur Lafferty, an introduction from this year’s editors (Jared Shurin and myself) and an afterword from the 2013 editors, Ana Grilo and Thea James of The Booksmugglers. Not to mention the beautiful cover from the talented Sarah Anne Langton. All proceeds from sales of this book are donated to Room to Read, supporting literacy and gender equality in education around the world. My contribution to this collection is an essay/critique of A Dance with Dragons by George R.R. Martin, where I analyze how fervor and anticipation can be the enemy of objectivity and fair reviewing practices. I am thrilled to be included in the anthology alongside other great fan writers such as Ana Grilo, Thea James, Paul Kincaid, Maureen Kincaid Speller, Jonathan McCalmont and Tansy Rayner Roberts. I mean, seriously, my essay comes directly after pieces by Abigail Nussbaum and Adam Roberts. Talk about humbling company. In addition to this, Speculative Fiction 2012 includes two other articles published on A Dribble of Ink: ‘Concerning Historical Authenticity in Fantasy, or Truth Forgives You Nothing’ by Daniel Abraham, and ‘Ma Vie en Zines’ by Chris Garcia. I hope you enjoy the book and, like I have, discover some new writers in the process.